This is the wrong picture to accompany this quote, but I couldn't help but snap a few pictures last week when I looked over and saw Graeme looking at one of my very favorite books by Jan Brett, The Hat, along with sitting with two of his favorites--his blanket and a car. *a little extra reading on the topic of Raising Boys that Read. My husband shared the article with me a while back and I bookmarked it for future sharing. What an encouragement to keep reading to that sweet little boy of ours who is practically running around the house nowadays! 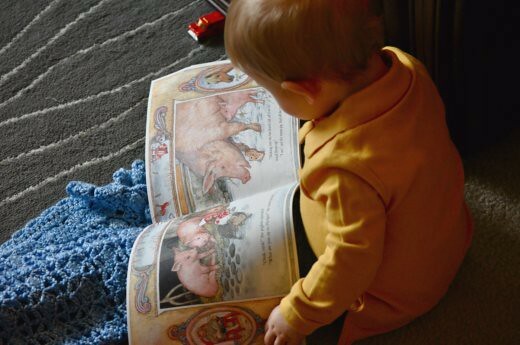 Oh, I LOVE this picture -- thanks for being such a good mom and dad and developing his love for reading! LOVE that quote. I will never forget that advise I got from a friend years ago...read to your kids! My girls now love to read and school is so much easier because of it. I am NOT a reader! I wish my parents read to me! Keep it up girlie! thanks,RR! I am headed there right now to check it out! sakes, I love this picture to death....it is the sweetest! I read so much to Conley and Brynn when they were little and am so thankful that they are both voracious readers. We have to go to the library every two weeks and load up on new books. It thrills me!.....but they do spend lots of time playing video games and watching television too.....:) as you well know! hah! And, the TV isn't really necessary for news. I found that I never knew what was going on, so I made a point of putting an RSS feed for a national news site and a local news site in my reader. Now I can at least read the headlines (even if I don't choose to read the article), so I can say I "heard" about such and such that goes on. Gotta love those readers. I use the my yahoo reader.